Fancy indulging your inner interior designer and creating a space where you really feel at home? With a House of Bath discount code you can get the home you've always wanted without breaking the bank. Whether you're looking for the perfect lampshade to finish off a room or a whole new three piece suite, a House of Bath promotional code will help you save the pennies. Founded in 1998, House of Bath was established to provide customers around the country with an easy and affordable way to order fine furniture and homewares direct to their door. Today, it's the leading homewares catalogue brand in the UK premium home shopping market, providing a wide selection of quality products for in and around the home. In 2004 the company was acquired by leading catalogue business JD Williams, allowing them to expand on their success and offer an even bigger selection of products along with fantastic dedication to customer service. With a head office in Bath and a call centre and warehouse team in Manchester, they are able to deliver your orders quickly, efficiently and at a value for money price. At House of Bath they are dedicated to providing stylish and inspiring products that help you achieve the look you've always wanted for your home. From unique and innovative solutions for every day needs to beautiful and comfortable furnishings, there's something to suit every budget and taste. Want a snug new arm chair for curling up and reading a book at the end of a long day? House of Bath have a wide selection in a choice of colours and styles. Or perhaps you want a gadget to make light work tasks like chopping and peeling? Check out their Home Solutions section for lots of fantastic ideas. As well as a wide range of homewares and home furnishings, House of Bath also stock a selection of products for your garden. From plant pots and paving stones to conservatory furniture, now you can transform the space outside your home as well as inside it. There's even a range of clothing that translate the House of Bath ideals of value and quality into a selection of comfortable and wearable garments. Want to get shopping with House of Bath? With a House of Bath discount code you can make great savings on their wide range of products. So whether you're furnishing your home from scratch or just looking to add a few finishing touches to a room, a House of Bath voucher code will save you money while you shop. Wide selection of home furnishings, homewares, gadgets and more. Browse our website until you find a House of Bath discount code that suits you, then navigate to their website to begin shopping. Enter your House of Bath promotional code in the box provided and click 'Apply'. Want to find out more about exclusive homeware with House of Bath? Why not pay a visit to their dedicated YouTube channel here? You'll find lots of exclusive content including new product previews, video tutorials, shopping guides and more. You can also use this channel to find out more about saving money with House of Bath promotional codes. If you've enjoyed shopping with House of Bath, you might also like to check out more great deals on home furnishings and more at stores like Homebase or B&Q. Or, if those aren't up your street, you'll find plenty more deals to browse in our Home and Garden section. Enter your House of Bath discount code in the box provided and click 'Apply'. Standard UK delivery costs £4.95 on all orders. If you need to return a product for any reason to House of Bath, you can do so by simply returning your items in their original condition within 28 days of receipt. Need to speak to the team at House of Bath? Whether you have a question about your order, want some advice on choosing the right products or just want to find out how you could make big savings with a House of Bath voucher code, you can contact the Customer Services department by telephoning 0871 230 0867. Want to discover more from House of Bath? Why not follow them across your favourite social media channels for competitions, product reviews, special offers and more. You can also use these pages to find out more about saving money with House of Bath promotional codes. Don’t forget to check them regularly, as you can never be sure when a free House of Bath discount codes might be waiting for you! 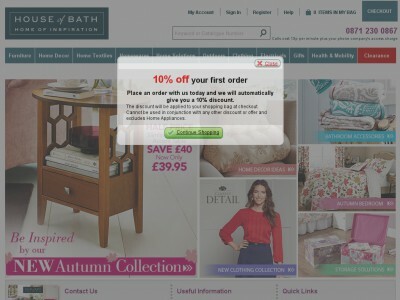 Buy now online at www.houseofbath.co.uk. I love shopping for bits and bobs to decorate my home, but I don't always have the time to trawl the high street. Luckily, I discovered a House of Bath discount code online. With a House of Bath voucher code you can get fantastic deals on a wide range of home furnishings, homeware and more at houseofbath.co.uk. I used my House of Bath promotional code to get a fantastic price on some lovely new cushions for the living room, and some new mugs too! So why not get shopping with House of Bath voucher code?